Whoever said, “It's lonely at the top”, may not have specifically been referring to centenarians. But there can be no denying that those of us that reach the top of the ageing plateau, and live to a century or more do face the very real possibility of having few of our life long friends and relatives joining them. Loneliness and its partner depression can be a very real problem for centenarians. Not to mention the emotional stress of outliving a spouse, and in many cases outliving children or even grandchildren. The fact is that any person who has lived to be 100 is likely to have outlived most of their living relatives - the support system that most elderly persons rely on for love and companionship. If a centenarian has living relatives they themselves may be so advanced in age that they cannot be the primary caregiver of the 100 year old. Studies have shown that the majority of long-term care given to the elderly is by unpaid caregivers. Furthermore the overwhelming majority of those unpaid care givers, almost 90% are family members. Ageing experts agree that as the numbers of centenarians continue to boom, this arrangement is likely to slip. So what is the super senior to do? Not give into loneliness for one thing. Just about every centenarian interviewed says they have maintained an active and happy social life. Even if that has meant leaving lifelong friends and relatives behind. Experts say this is part of the “roll with punches” attitude toward life in general that one sees in most centenarians. They seem to exhibit a remarkable ability to shake off what life has thrown at them, and move on. The ability to rise above it all is one thing, still the need for companionship in living to 100, and staying healthy once one gets there cannot be understated. Centenarian Rosella Mathieu says we never outgrow our need for companionship. 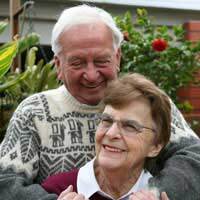 She believes that cultivating close relationships with friends and family are as important as physical activity and a healthy diet to enjoying your senior years. Rosella says leaving behind past, comfortable relationships can be one of the hardest parts of reaching one's 100th birthday. She says she was happily married to the same man for 70years. She was very used to having a man in her life. Now that he is gone and she is older she says it is still important to have someone around who is very close to you. While love has not hit Rosella yet “The Second Time Around” she is a proponent of second romances, and she is encouraged to see such relationships becoming more accepted. Rosella considers herself among the growing group of centenarians that just refuse to accept loneliness as something that comes with the territory. Having friends is only part of the picture. Staying active and doing things with them is another. Rosella played tennis up until her 80’s and was still taking laps in the pool at 90. She cannot do those things now, but she keeps walking for exercise. She says you have to keep moving and even if you need a walker, walking is a great way to do that, and to be social. An evening walk with a friend, or even a nurse can be stimulating both physically and emotionally. Rosella laments that she is not as active physically as she once was, but her mind is sharp. And that is all the more reason she loves to interact with people. She says people her age have great stories to tell. Younger folks should take the time to listen and engage people like her in conversation. She has formed many friendships with people much younger than her because of her interest in others and the world around her. Her advice to seniors who want to make new friends? You have to be alert and open.